I very much like the cut of your jib. Please sponsor me and my family so we can work and live at River Cottage. Your vegetable garden makes me swoon. 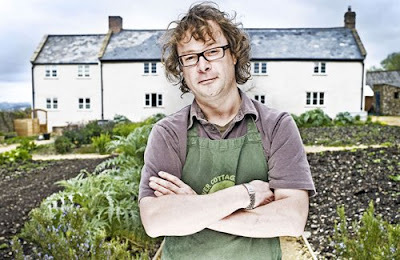 Please tell me I'm not alone here in my love (in a non-husbandy way, of course) for Mr Fearnley-Whittingstall. He's so earthy and funny and embracing of the simple life. And he's so fabulously...British. The River Cottage life runs pretty parallel with my ideal lifestyle, and I sometimes dream about living on a big farm, in an old farmhouse, with a huge, abundant vege garden and a handful of livestock, living off our land as much as possible. But the reality is that that is a full-time job and Mr Fearnley-Whittingstall most likely has a staff of gardeners and stock-keepers who look after it all for him. It's Time... Organic Mascara, Here I Come!